Hate to say this, but both Tom Brady and Carson Palmer looked like ghosts of their former selves this weekend. Both of them looked confused, jittery and unable to throw downfield with authority. I mean, I was actually starting to feel sad for these guys. Wait. Arodis Chapman is going where? Cincinnati? Are you kdding? How the heck did they outbid everybody? Where was the Angels or Red Sox or Cubs—the big spenders. All kidding aside, its not like lefties who throw 100 mph grow on trees. Curious that the big spenders didn't bid on him like they did Dice-K.
Gotta give Mike & Mike credit. They were exactly right when they said this morning that the NFL's Rooney Rule has become an embarrassment. Instead of forcing GMs to interview minority coaches now it become a joke. Tony Dungy said it right, "That is not what the Rooney Rule is supposed to be, [that] you make up your mind and then interview a candidate for it anyway just to satisfy the rule." Avoiding the question if the NFL even needs a Rooney Rule anymore, when minority coaches have head coaching positions in Tampa, Chicago, San Francisco, Pittsburgh, Indianapolis and Cincinnati, the fact is that the good intentioned rule has become a mockery—and insulting to black head coaches who have to interview for a job that they know has already been filled. In the "No duh" news of the week, Richard Seymour wants out of Oakland. Ummm, sorry Rich, that "Franchise Player Tag," it's heading your way. Supposedly, GM's around baseball are all swearing on a stack of Bibles, Torahs and Korans that Johnny Damon will end up back in New York. They feel Damon's price will eventually come down, and the Yankees will offer him a contract that will allow him to save at least some face. And as usual the BCS Bowl was kind of a let down. Except for the Texas-USC game in 2005, the games usually turn out to be...well, kinda boring. Come one and let's get a playoff system already, and have at least some excitement in the CFB postseason. Clay Matthews....is gonna be a good one. He seemed to be everyone yesterday against the Cardinals. Good thing, because no other Packer seemed to be anywhere. More and more, I get the feeling that there is no way that the Knicks get LeBron James to come to New York. The Oakland Athletics' prospective move to San Jose is heating up and Stand for San Jose, a coalition of San Jose Giants fans, is asking that the Athletics be responisble for any economic shortfall in the event a new stadium is built for them. Stand for San Jose opposes public funding for a new ballpark and it’s supported by both the San Jose and San Francisco Giants. San Jose Mayor Chuck Reed has called the group a front for San Francisco Giants interests. Apparently the Giants claim that San Jose is, to put it in street terms, "their turf," and if the A's moved there, it would hurt them financially. Which is a load of crap. Right now, according to Google Maps, the A's and the Giants play 20 minutes away from each other. How the heck would moving the A's 45 miles to the south “undermine the financial viability of the Giants,” at all? AAPTBNL Man of the Week...gotta be Ray Rice. 22 Carries for 159 yards. 7.9 YPC against the Patriots and Belichek! Damn! That's a career day you can tell your great grandkids about. Excellent performance Ray! And lastly...Say it ain't so! 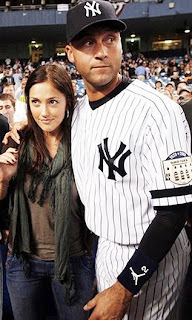 According to the World's Most Dangerous paper, the New York Post, Jeter is all set to marry Victoria's Secret model, and world class hottie, Mika Kelly this year. And as always, Jeter, who expects to win all the time, made sure his wedding was schedule for a few days after the 2010 World Series game 7 is set to be played. Well done on the planning Derek. And hey...outstanding pull on the girl. Remember how you asked what would be the worst free agent signing earlier? I change it now to Aroldis Chapman going to the Reds. Not that Chapman's bad by any means, but going to the Reds was dumb. Dusty Baker is going to make sure he doesn't have any remnants of a throwing arm by July. Other than the money spent, many teams would like to have what Dice-K has provided , Chapman has 100 mph fastball, thats all so far. I am wondering when Carson Palmer is going to be questioned more about his inability to win the big game? Heck, Tony Romo has been asked this more often and he was an undrafted free agent. Carson Palmer was the #1 overall. It isn't something I put a whole lot of stock in, but I am just wondering when they will begin?